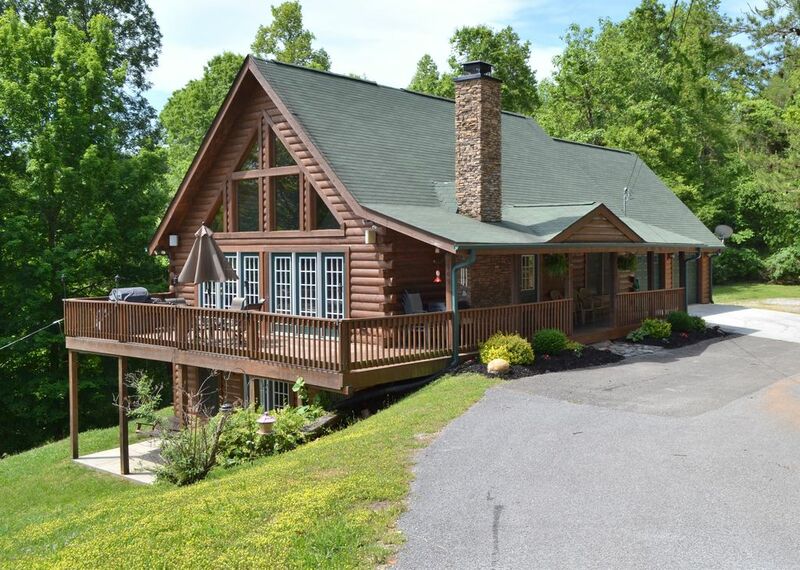 This beautiful 3000-square-foot cabin rests in the back of a secluded cove with a gorgeous view of beautiful Lake Norris in the private Shanghai Homeowners Association. For all of you that despise steps, this is the house for you. Parking is conveniently located very near the boat dock, making the walk with all those coolers and extras a piece of cake. The drive to the dock only takes a few short minutes from the house. Our dock is private and can fit 2 good size boats with the addition of a couple jet skis. Your boats are safe and can stay in the water during your entire stay. Don't feel concerned about traffic because you’re inside the gates of a private community. This five bedroom, three level home offers many extras. Four bedrooms have one queen bed in each room and in the loft bedroom there are two queen beds and two single beds. With the spacious living area it offers, it makes a great home to party with friends and family. The house is equipped with a fully functional DVD, CD indoor and outdoor surround sound. The pool table located in the loft makes for fun filled evenings. For those morning ice runs to the dock, don't worry about it. This house has a commercial ice machine located on the deck. The covered and wrap around deck with our unique tiki torch setting makes for beautiful evening socials. Parking? No problem. Plenty of parking for all your vehicles and trailers at the house. Additional trailer parking is also available in areas in our association. For further information, please call the owner. toilet, shower, Bath towels are not supplied. toilet, combination tub/shower, Bath towels are not supplied. Each bathroom is supplied with a couple rolls of toilet paper and a hand towel. Bring your own bath towels, shower products and additional toilet paper. Beautiful view of the lake but also has a private dock located below the house. There are no steps directly from the house to the dock. Bed sheets provided. Couple extra comforters, pillows, and blankets provided. Plenty of parking located by house. Internet available. No streaming of music, movies, etc. allowed. Kitchen towels provided. Bring your own bath towels. 2 living rooms with TV's and DVD players. One located on main level and other in the basement. Have 2 full size refrigerators. One located in kitchen and the other in the basement. 2 regular coffee makers with filters supplied. Bring your own coffee. Minimal pantry items. May want to bring own salt, pepper, and other spices. Plenty of pots and pans, silverware, 2 dining sets. Fully equipped with two dining sets, silverware, utensils, pots and pans, 2 crockpots, griddle, blender, and toaster. Kitchen towels, dish soap and dishwasher soap supplied. One located on main level and another in basement living room. Surround sound system that can be played inside, outside, or both. Some flat lawn located in front of home and behind home. Commercial Ice Machine, Indoor/Outdoor surround sound, Private boat dock includes electric and lighting. Very convenient boat dock access. If you are concerned with Steps to the water, this is the Vacation Home for you. There are no steps from house to boat dock, but is a very quick & easy drive to the dock so no need to worry about carrying everything up and down the steps. We had a full house, and the house was perfect. Prompt return of the securtiy deposit and the dock was located in a protected cove and we didn't even have to drive off to find a place to swim. The lake house was absolutely perfect. Every room was very clean, location is excellent private dock was very nice to relax on. Ice machine came in handy every day on the water . Only complaint would be our stay was too short. We had a wonderful time at your place! Very spacious and comfy! Loved the commercial ice machine! Weather and water we also wonderful! Thanks again for letting us stay at your place hope to stay there again! We recently rented this property for a family vacation. Upon arrival, we noticed a smell on the main floor of the house. We ended up finding dirty swim trunks on the floor in one of the bedrooms. We were disappointed to find out when we got there that the commercial ice machine listed in the description does not exist. The house is beautiful and it served its purpose for our family, so it’s a bummer that the experience wasn’t the greatest. There was a list of things we needed to do at the end of our trip to the house to get our deposit back. The beds were stripped, rooms cleaned and trash taken out. We spent a lot of time that morning to make sure the house was in great condition when we left. After we left, we received a message that the house wasn’t left in good condition, that there were stains and holes in the sheets, and that a drawer in the fridge was broken and because of those things, we were not going to get back our deposit. We know the condition of that house was great when we left! We were told it normally takes 3 hours to clean the house but that it took them 6.5 hours to clean. It is a huge house! 3 bathrooms, 5 bedrooms, 8 beds..plus all the bedding to wash...I would say that it would take more than 3 hours to clean. It seemed as if the owner just wanted to use this situation to replace some things in his house. At this point, we don’t even care about the money, it’s just a shame that the owner is out to make it seem as if we trashed his place and we absolutely didn’t. Beware renting from him! You can count on losing your deposit no matter what. We are sorry that you feel this way but the following text came directly from our cleaning service that we have used for multiple years and have never had a complaint like this from them before. "Hi *****, the house was unbelievable today. It has never been this bad in all the years I have cleaned. There was trash under the beds, gum on the couch downstairs. A sheet that holes in and stains wouldn't come out. I am going to send you pictures. Stains on comforts. It took 6 and half hours to clean. If renters had been coming in today I wouldn't have been able to get it clean in 3and half. I highly recommend you keep their deposit. I have ask you for extra cleaning money. The toilet roll holder is gone." After purchasing new sheets, a comforter, new drawer for fridge, and paying the extra cleaning fee, we did graciously refund you a portion of your deposit in which the remaining portion did not cover the full expense of the unexpected items we had to replace/pay for. We do apologize for the inconvenience of the unintentional circumstance of the broken ice machine which was being repaired at the time of your stay but it is existent and fully operational again. We certainly don’t rent our home to hold renter’s deposit but rather we rent it for people to enjoy and to treat our home like it's their own. Home was perfect for our guys this past weekend! everything was clean and nicely decorated! Owners were very easy to communicate with! Home was perfect! Everyone has a great time! Would definitely recommend anyone staying in this home! Located near several Marinas, which includes dining, boat & Jetski rental and many extras.